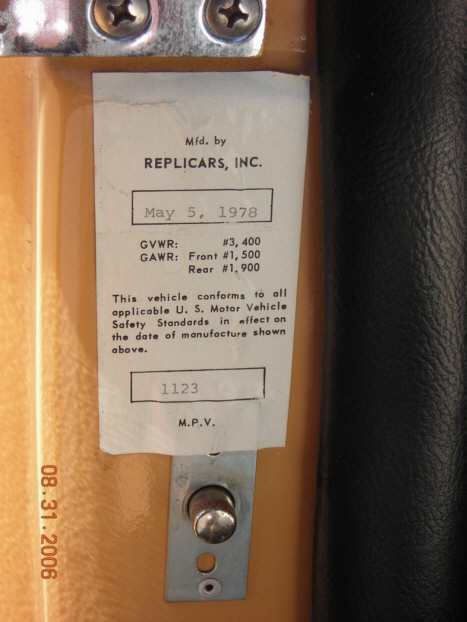 The VIN tags on Glassics (1966 to 1974) are in the same place as they are on Replicars (1976 to 1981), but the tags are different in appearance. Both are a three - or four digit number starting with 101 for the first 1966 sold, and ending somewhere at or beyond 1505, with the last Replicar sold in 1981. In both cases, the VIN tag is on the driver's side door post. Not on the door itself, but on the upright that has the door hinges attached. 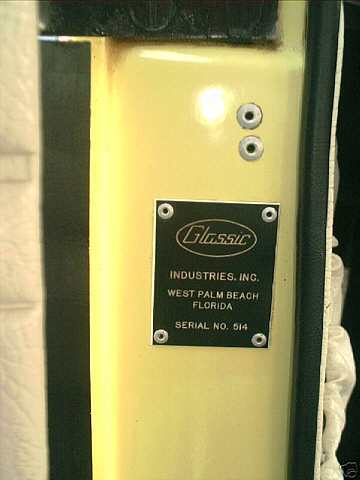 The Glassic tags were plastic, pop riveted on, and the Replicars were aluminum looking stickers. Here are samples of each. DMV assigned alternative VINs - This info is being added in Feb. 2017. I am sure that it appears elsewhere on the site, but, a Missouri owner's horror story reminded me to post it clearly. A good number of Glassics have different VIN numbers that have been assigned by Department of Motor Vehicles offices in various states. For whatever reason, they do not accept the three or four digit numbers from the original VIN. 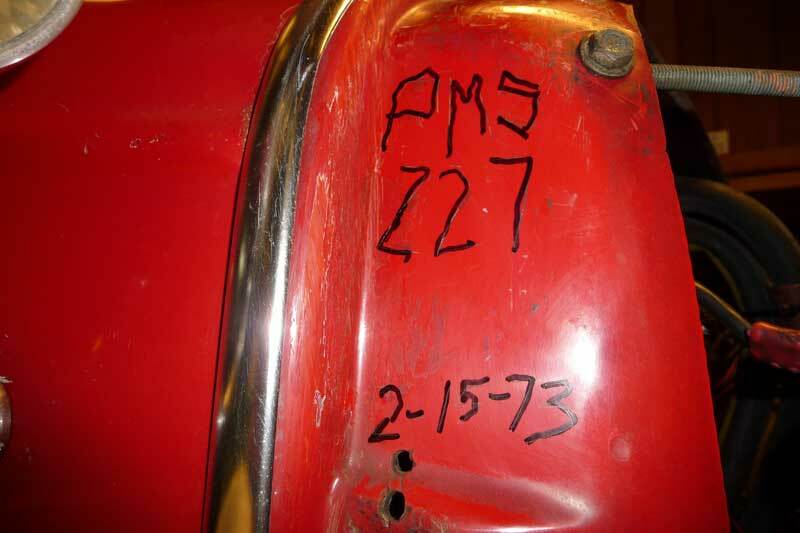 The Missouri buyer of car 725 got his title from NJ with an odd NJ VIN, and was able, with a great deal of difficulty, to get the title restored to the original number. The car that the Annexmaster bought in California had a DMV issued number and Florida, (its original home) was not in the least interested in the original number. The CA title said XXXXXXX so, that is what the car was. - My current CA car had, and still has, the original 689 VIN. Advice for owners of cars with DMV assigned numbers -- look for someone in the DMV who is their "expert" on collector cars, or OLD cars. Most of what the Motor Vehicle people deal with are current models, and they tend to not want to spend the time on old car issues. An employee friendly to our needs can go a long way in resolving problems. Duplicate VINs - Comments: Glassics and Replicars have some overlapping VINs . When Replicars began, they started at VIN 1001, but Glassic had already gotten up into the 1200's. - there is no reason to believe that the same VIN could not have been accidentally issued at the time of manufacture. There were also instances where cars were sold before actually being manufactured (pre-sales) and confusion could have arisen. No malicious creation of duplicate VINs has been reported to (or discovered by) the Annex. Cars 1001 through (about) 1211 are likely out there -- one with a Glassic plastic vin tag, and another car with Replicars paper vin tag. Mis-match between VIN tag and other markings on the car. On more than on occasion, the VIN tag and the frame marking, or hood scratching, or some other VIN identification do not match each other. Mostly they have been a few digits off. Also (and this has been reported elsewhere on this website) the VIN number is out of sequence for the apparent year of manufacture. The best information is that human error and casual recording systems were in play. Hypothetical example: Mrs. Smith orders a car for her husband for Christmas. She pays for it, and gives the company her specifications. The company assigns the next vacant VIN tag to that car. Christmas comes and goes, and the car has not been completed. The paperwork goes to the manufacturing floor, and they grab a frame that was already destined for another car. They put the VIN tag from the paperwork on the car -- now you have two numbers, one on the frame, one on the tag. Then it is January before the car is titled in its new state. It had never been titled before, so the current year is used. Now the car has two different numbers, and a year that does not match. This type of thing was not unique. The Annex has presumed that the VIN tag is the true number. If the VIN tag has gotten lost over the years, then it leaves a problem behind. Likewise, if the wrong number is on the frame, what became of the VIN tag that goes with that frame marking. "Reproduction" VIN tags - Comments: Fake tags are to be found on the site - often on cars that have been re-painted. No signs that this was done for any evil purpose. 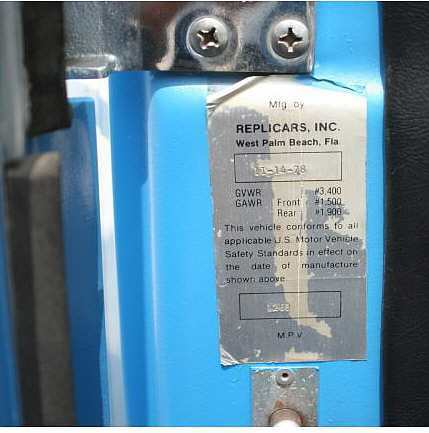 Replicars tags are shiny paper and prone to wear and tear, and the plastic Glassic VIN tags can get brittle and can break when being removed for painting. Some tags are made to look like the originals and others are just to identify the car. Model A parts suppliers can make you a Model A metal tag with whatever number you wish. At least one Glassic has that type of identifier. In 2014 I have added this bit of information, that may appear elsewhere on the site, but bears repeating. (as a side note, yes, I am aware that VIN stands for Vehicle Identification Number, so a "VIN number" says Vehicle Identification Number number. It is wrong but a commonly used phrase. Anyhow, Many DMVs (Department of Motor Vehicles) or other agencies that keep track of titles and license plates seem to have issues with the original VINs having only three or four numbers - so they require a made up number that might fit their computer system better. When we are lucky, the original VIN is worked into the new number -- other times, a completely made-up number is assigned to the car. I am sure that there are other instances where a car ends up with a different VIN (plate removed for painting and then lost, abandoned car assigned a new VIN, and so forth) but here are two examples that I know about, and a third that I recall from the past. California: Car 689 has no problems at all - it is my car, registered and titled in California. However, a few years ago, while living in Florida, I bought Calif. car 1239. It was titled as DMV66844CA and, as I recall, there was a plate on the door post (no picture taken, unfortunately) Also on the car, was the original sticker VIN of 1239. When I got the car to Florida, the FLA DMV had zero interest in restoring the original VIN to the car, so I had to title it with the made-up number. (Side note: Car 1239 had the number 1241 marked on the frame of the car - probably a change of plans during manufacture). Recently a new owner send along the picture below. This car is #168. Somewhere along the line the original tag got cut down, affixed with phillips head screws, and the added tag riveted below. The car is titled as a 1968 (probably was made in 1966) so in this case, the tag pays homage to the original VIN. FOR could be FORD, or could mean that the body was FOR car 168, a 68. At one time I was sent a VIN tag to identify, and found it to be a Ford Model A reproduction tag that can be bought from Model A parts stores and come blank, with a provision to stamp any number one wishes. I don't recall if that car had the original number or something different - but in that case, the original plastic tag was gone. The lesson here is is that while most cars still have their old VINs, things happen (the car in the picture below was painted and the tag was likely removed for that process and replaced with screws - minus the original VIN number) some DMV's want to" help" with the numbering system, and titles get lost and so forth. Added to some quality control issues in a small manufacturer, there is a bit of guesswork involved in identifying the cars sometimes. PMS numbers (not the same as the VIN) scratched into cowl area on some cars. an actual VIN was assigned. The numbers discovered so far seem to be "off" by similar amounts from the VINs. 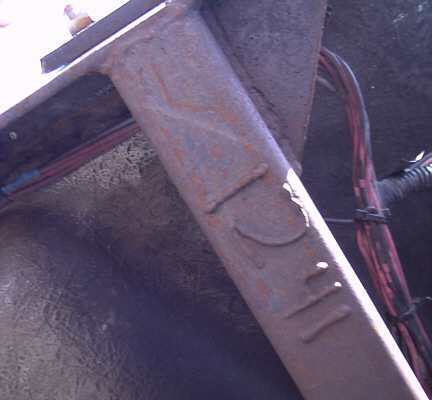 Above: car 689 with PMS info and date circled. 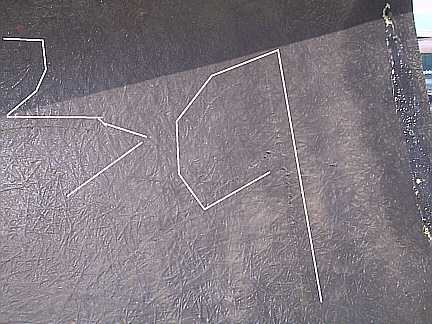 below, outlined in magic marker for visibility. You are looking up under the front bumper on the driver's side of this 78 Phaeton. 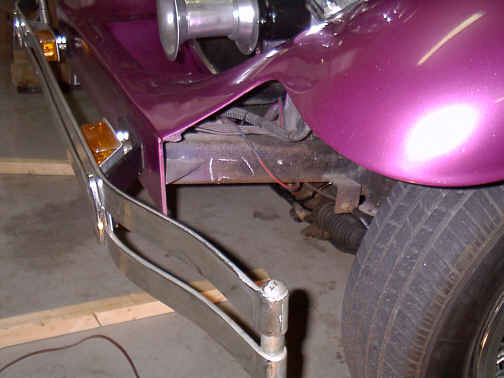 The purple is the little flat panel in the front of the car, right behind the bumper and below the grill. The parking light and turn signal is not original to the car. 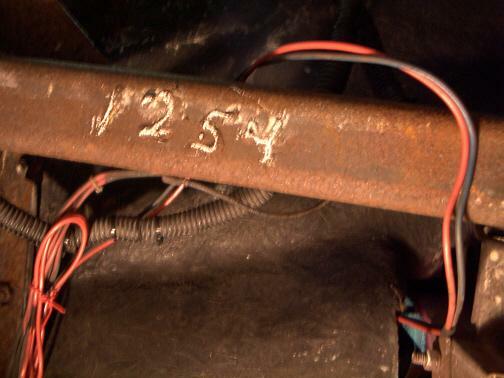 On the bottom side (facing the ground) a few inches back from the front of the car are very poor welded beads making crude numbers representing the serial number. This is a closer view of the number with the bumps chalked over so you can see them. The red and black wire is not in the top picture, so don't use IT as a reference. The tops of the numbers are nearest the driver's side wheel, bottom toward the center of the car. The 1 is at the front of the car, the 4 at the rear. I share this detail, because the numbers are very hard to read! does not recall this placement, and car 1239 has a similar stamping -- see below. This close-up is after sanding the surface and trying to fill the indents by rubbing chalk over the surface and wiping away the residue. The oval was drawn in by the computer. The number is 1254. 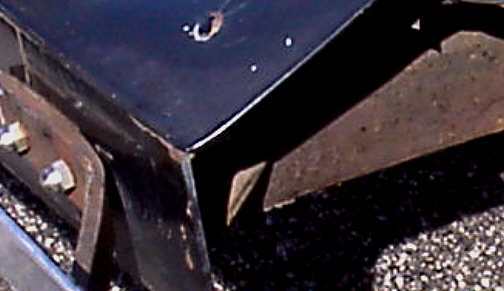 See that the number is just to the rear of that triangular brace at the front of the frame. 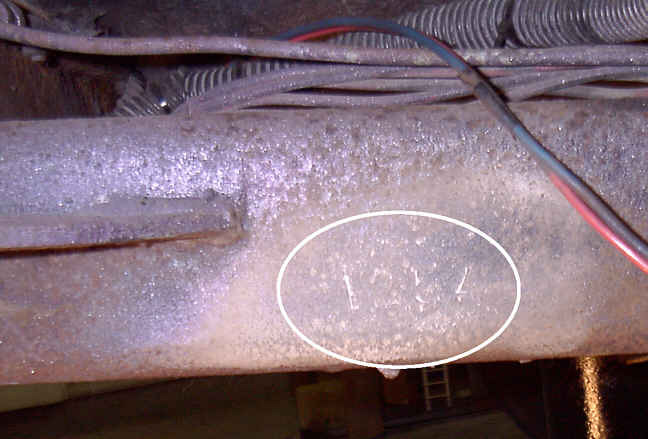 The Photos below are of car 1239, a 1978 Roadster. Yep! 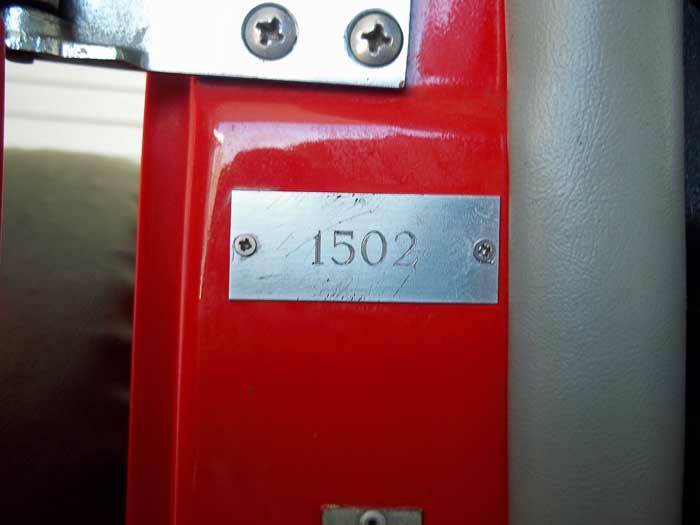 the number above is the marking on the frame of car 1239! Joel, the builder had hardly any recollection of this numbering system, nor why the frame number might not match the VIN sticker. The above view is looking up from the ground. Unrestored car 1239 also seems to have the number stamped on the SIDE of the front frame rail. In this case it 123 is visible, which doesn't match the number on the bottom of the frame. 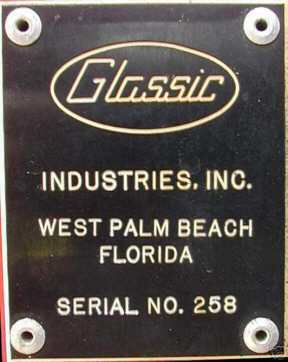 Our joint best guess is that the frames were numbered in the shop by the person welding the frame and the number assigned based on what body style it was supposed to go on, or perhaps which body mold would be used with the frame. Then, when it came time to title the car, the next VIN sticker that was not yet gone was assigned to the car. Perhaps there was a rush to finish a car for someone, and when the car was ready to go, (maybe out of turn) it was assigned the next un-issued sticker. So, as of Jan. 2007 I have uncovered a couple of these mis-matches. Since the sticker seems to be what is on the titles, I have assumed that the sticker is the CORRECT VIN, and the frame number is incorrect. 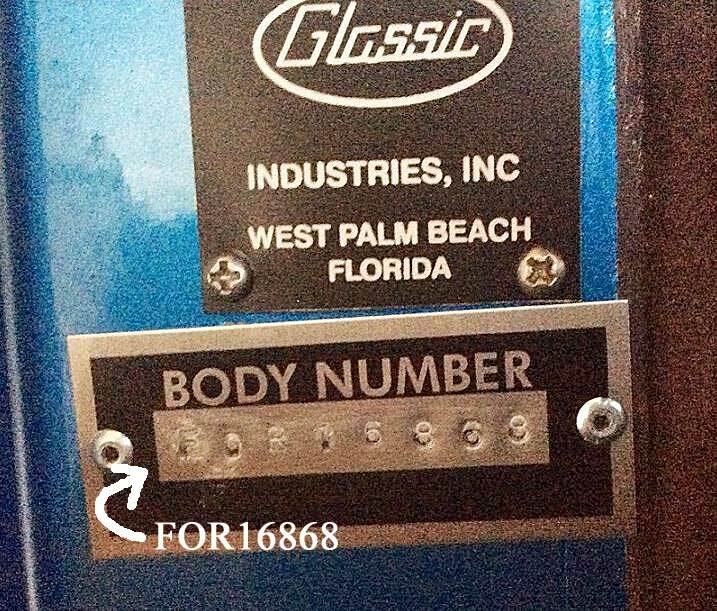 ALSO -- some of the later Replicars had a number scratched into the inside of the fiberglass hood. It was probably done to match a hood to a car. The number was several inches high. This picture is only to give you an idea of what to look for. Car 1239 had "#" (the number sign) "239" scratched in the driver's side underneath of the hood. The number is almost invisible and even with my white lines you can hardly see them. They were done like with an ice pick and are about 6 inches tall. 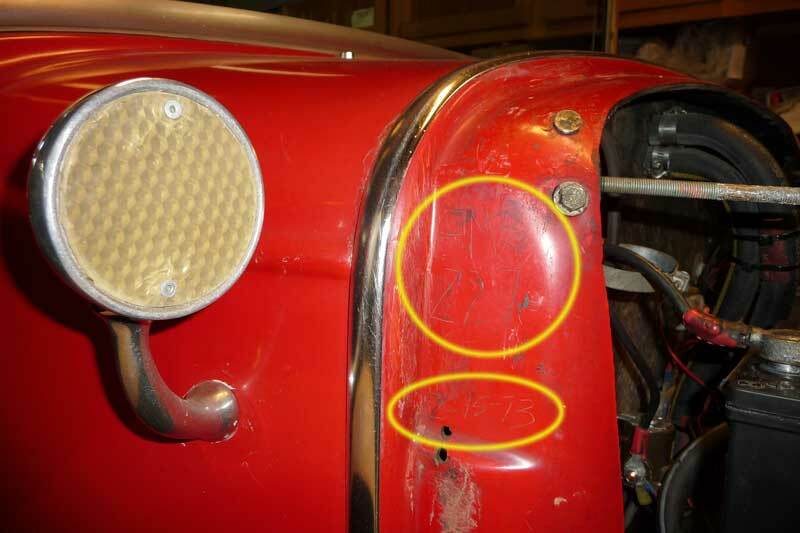 They were scratched in very crudely and probably just to identify one of a few cars that were being constructed at any one time. In this highly enhanced photo, the 9 is within the white line area, and the 3 is scratched to the left of my white lines. The upper right corner of that picture is the back edge of the hood. 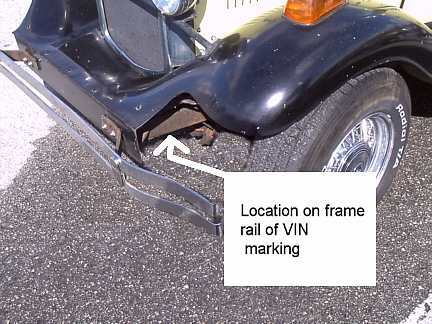 Anyone with info about these secondary VIN locations from cars other than 1978, please send me an email to GlassicAnnex@aol.com . 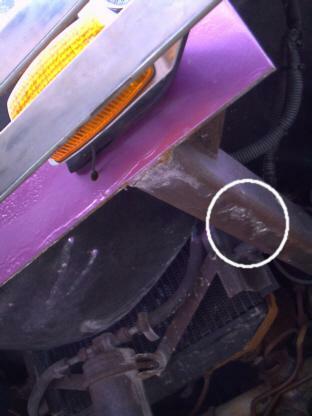 In 2015 we heard from car 1502, where another mis-match showed up, this time with the marking on the frame front cross member, just below the fan pulleys. 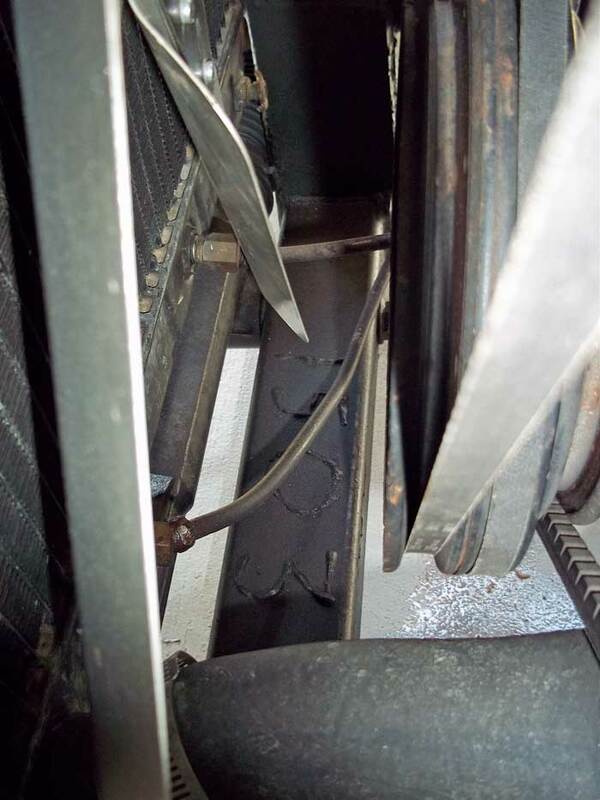 above: looking downward from driver's side below the fan blade, is the frame number facing upward and toward the front of the car. Above - the same picture as above, flipped 90 degrees and sharpened up as best possible. And the replacement VIN tag on this highly modified and repainted Roadster.